Safe Lifting Over Christmas - the Chiropractic way! Christmas dinner anyone?? I love a juicy turkey with all the trimmings but if you’ve got your family coming around for Christmas lunch that turkey ends up being pretty hefty. Not to mention if anyone is staying over and you spend lots of time cleaning the house and making up beds. 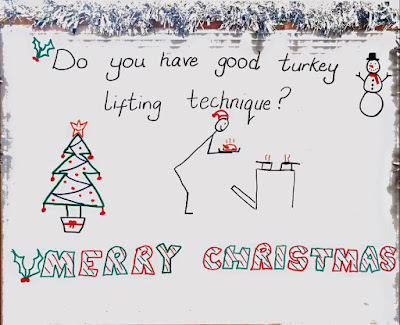 The last thing you want on Christmas day (when your chiropractor is at home enjoying their own Christmas dinner) is to hurt your back lifting the turkey into or out of the oven. So here are some good bending and lifting tips to make sure the lifting of that giant turkey doesn’t spoil your dinner!! This pattern of movement ensures that you don’t add extra stresses to your lower back and spine, this is always a good way to bend especially when you are adding weight in the lift. You can practice doing the hip hinge correctly with a broom or mop handle, if the pole stays flush against your head, mid back and bottom as you bend then you have the movement pattern correct, the aim is to bend at your hips and not in your lower back. For a deeper bend that wont stress your lower back, when you come back to standing make sure you push up using your thigh and buttock muscles, as this will protect your back; one way to acheive this is to push your feet into the floor as you come back up from the bend. To help your body get used to a different movement pattern it is a good idea to practice the movement at other times as an exercise, so that when it is crucial to protect your spine you acheive the new movement pattern more naturally. A squat exercise is a good way to practice this movement pattern, whilst strengthening your thighs and buttock muscles at the same time. So, we've demonstrated how to maintain your spinal health but we also need to keep those knees in good condition. When you bend you want to do it as if you were going to sit on something behind you - so that your knees do not go forward of your toes as you bend down, this prevents extra stress on the knees. That's the bending sorted, now for the lifting. When you lift a heavy weight you want to fix your shoulder blades back onto your rib cage to ensure you use the big muscles in your back for strength rather than the small muscles at the top of your shoulders, this simple technique will aid in keeping you injury free. Have a happy healthy festive season!